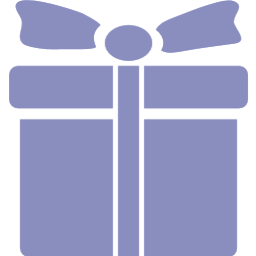 We have 2 walking packages along the Carmarthenshire Coast Path, one ending at Penclawdd with a shorter package ending at Llanelli. Day 1 Own arrival to Amroth. Day 2 Amroth to Laugharne 10 miles/16 km. The first day is more demanding than the rest as you leave the Pembrokeshire Coastal Path, going along undulating sections to Pendine Beach famous for its attempts at land speed records. Visit the Museum of Speed just off the path. Inland to St. John’s Hill above the saltmarsh where “the hawk on fire hangs still” (Dylan Thomas) to Laugharne. Remember to visit Brown’s Hotel, Dylan Thomas’ favourite “watering hole”. 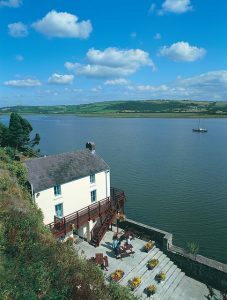 Day 3 Laugharne to Llansteffan 15 miles/24 km After visiting Dylan Thomas’ “writing shed” and last home -The Boathouse – today’s walk takes you from Laugharne to St. Clears. 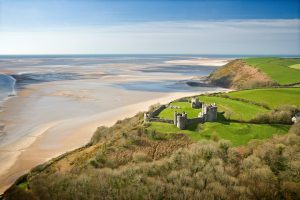 Experience dramatic coastal views towards Llansteffan and its impressive castle. Cormorants, lapwing gulls, sandpipers and herons along the way. Day 4 Llansteffan to Carmarthen 9 miles/14.5 km A mainly inland section with tracks, field paths and minor roads taking you to the market town of Carmarthen with fine views along the Tywi Estuary. An area of ancient woodland at the Green Castle Woods Nature Reserve by Llangain is one of the highlights today. Day 5 Carmarthen to Kidwelly 14 miles/22.5 km Country roads and field paths with fantastic views across Carmarthen Bay as you pass through Ferryside and the quaint little village of Llansaint. 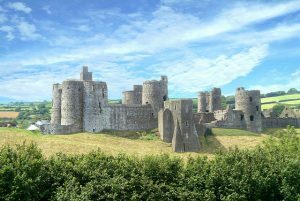 Reaching Kidwelly with its well-preserved castle you are now in the heartland of West Wales where the Gwendraeth Fawr and Gwendraeth Fach rivers meet. 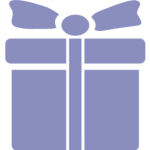 Day 6 Kidwelly to Llanelli 15 miles/24km From the Gwendraeth Estuary to the Loughor Estuary this easy low level section passes through the large pine plantation of Pembrey Forest that backs onto the glorious Cefn Sidan sands. Crossing through Pembrey Country Park the path goes into Burry Port with its marina and lighthouse ending your day at Llanelli. Day 7 Llanelli to Penclawdd 11 miles/17.5km From Llanelli, passing the National Wetland Centre, a bird watcher’s paradise, onto the Loughor Bridge across to the County of Swansea and the Gower, the next stage of the Wales Coast Path. Walk ends at Penclawdd famous for its cockle industry. 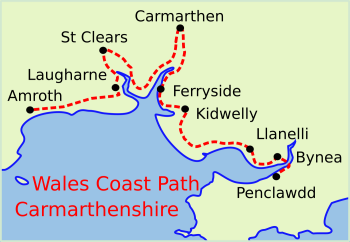 For other areas of the Wales Coast Path.